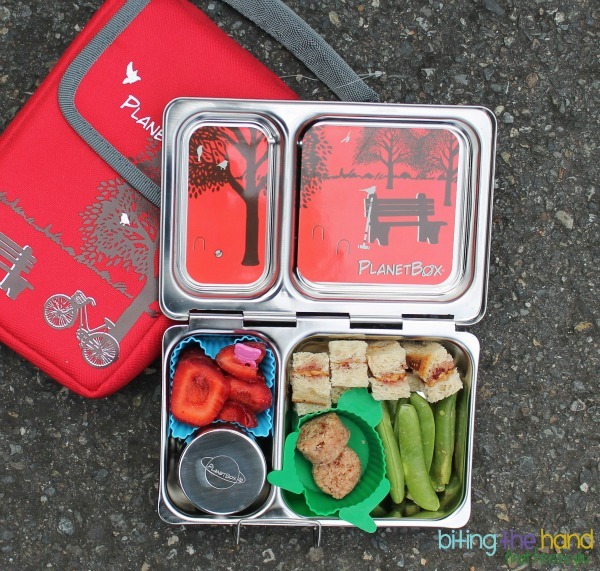 Biting The Hand That Feeds You: A Day at the Park with the NEW PlanetBox Shuttle! 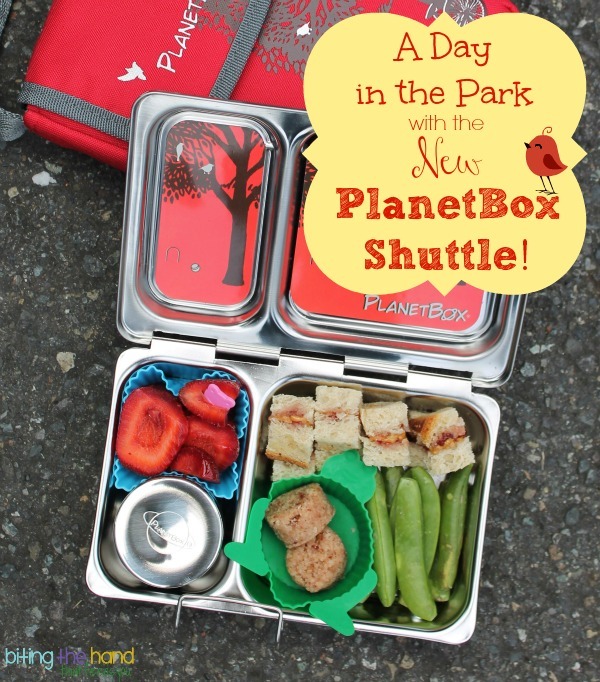 A Day at the Park with the NEW PlanetBox Shuttle! I've coveted a PlanetBox Rover for years... years! And I finally went and bought one this January, and we love it! Well, at first Hubby hated it, until I told him it was dishwasher safe! Ha! Z can open and close the clasp herself, so I feel confident sending it to school, and the dippers are a breeze! Plus all the magnet designs allow it to grow with your child as their likes and tastes change. Win-win-win! So imagine my excitement when I heard a new design was being released! The red bag and magnet set are named "Day in the Park," and on this particular day, we happened to be heading off to spend a day at the park! So I went with a froggy pond theme, since it was as park-like as I could do! Easy to clean - dishwasher safe! Very durable! If you treat it right, it could last their entire school career! Small enough to fit on a lap in the car! Woop! Still big enough for a grown-up appetite - holds nearly 3 cups of food! The new PlanetBox Shuttle is $34.95 for the box and dipper, or $39.95 for the box and dipper with bag and matching magnets. With four designs to choose from, I say pay the extra $5 for the bag and magnets! *Please note that I only applied the magnets to the inside of the box for the photos. I do not recommend using them on the inside when closed. They are wipe-clean, but too much exposure to food and liquid and the designs could start to wear and peel. [Disclaimer: This post contains affiliate links. Great review! And that lunch looks so yummy! We love Hail Merry macroons!